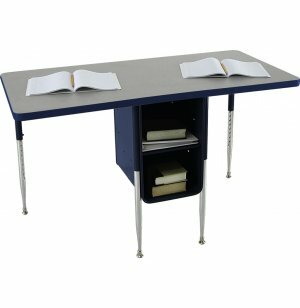 Adjustable Height Double School Desk 24"x48"
If you are looking for a space-saving alternative to the classic school desk, the Two Student Desk from Allied Plastics is an excellent option. These units enable students to work side by side while simultaneously enjoying personal work space. 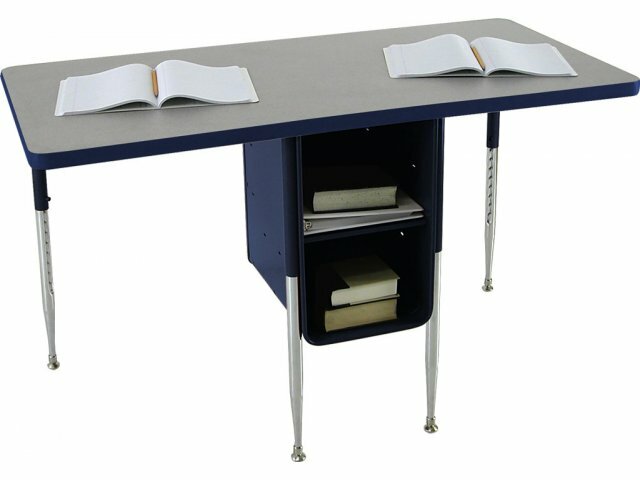 A double bookbox separates the two sides of this school desk so each student has an individual place to work, and a place to store books and school supplies. The unique design also provides plenty of open leg room under the work surface. Durable construction and high-quality materials ensure that these double student desks will serve many years of students. Their particleboard tops are covered with smooth high-pressure laminate. The writing surface is supported by adjustable-height legs with heavy-gauge steel construction. The student- and space-friendly design, and durable construction of these school desks make them a great choice for any classroom. Great Storage: The double-tier bookbox provides individual spaces for storing books, school supplies and more. Each compartment measures 48"W x 24"D x 8.5"H.
Smooth Surface: The 1-1/8"-thick particleboard top is covered by a high-pressure laminate writing surface. Tough Build: Heavy-gauge steel construction provides superior support to the desktop. Adjustable Height: Legs are height adjustable and are available in two ranges to suit students of various sizes. The lower range is 15-24.5" and the higher range is 20.5-29.5". Spacious: The open sides underneath the worksurface supply abundant legroom for both students. Custom Selection: A choice of top and frame colors lets you choose the style that suits your learning space.